"My son designed this," says David Shelton, father of David Shelton, who was convinced that the best way to use his general aviation aircraft would be to take his ground transportation with him. "He saw the roadable aircraft," says Shelton, " and he thought, there has to be a simpler way." 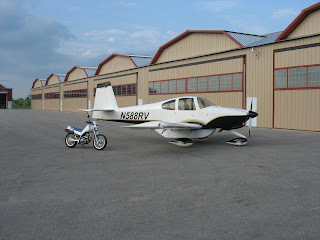 Shelton purchased a Van's RV-10, and has modified it to accept a 40-pound, custom belly-pod that carries a modified Yamaha ST 225 motorcycle safely and aerodynamically inside. The quick-fitting pod can hold 260 pounds, and attaches via a patent-pending winch system to four reinforced brackets on the RV-10's belly. Load testing and flight testing of the product are currently in progress, and it looks like there are no handling penalties, and only an 8-knot speed penalty for the pod on the RV-10. Shelton has incorporated Motopod. He's taking deposits on the RV-10 pods and considering STCs for the Cirrus and Cessna 182. Shelton is giving a forum on the project Friday, August 1, at Pavilion 002, during AirVenture. 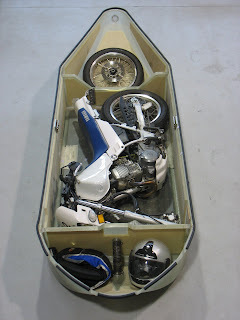 You can find more information on the Motopod at Motorcycle Pilot.